Cotton is a strategic crop with a critical role in the economy and agriculture. The increasing price of crop inputs is the main challenge for the developing countries, including Iran, so that it is crucial for the economy of the states to recognize the underpinning factors. Accordingly, the present study aimed to identify the relationship between price shocks of cotton production inputs and cotton price in 12 provinces of Iran over the 2000-2016 time period using panel-data vector auto regression (PVAR) model. The results to estimate the model and to check the interrelationships of the research variables in the context of the impulse response functions and analysis of variance showed that the variables of seed price, labor price, and pesticide price have a significant positive relationship with cotton price with the numerical values of 0.296, 0.002 and 0.017, respectively. The relationship of the variables of land and fertilizer prices was found to be negative but non-significant with the numerical values of 8.23 and 0.118, respectively. According to the results, to avoid the price volatility and shocks in input and output markets, it is recommended to organize and regulate the demand and supply system of the inputs and output. Akaike, H. (1969). Fitting autoregressive models for prediction. Annals of the institute of Statistical Mathematics, 21: 243-247. Alan Ker, N. L; Sam, A and Aradhyula, S. (2017). Modeling regime‐dependent agricultural commodity price volatilities. Agricultural economics, 48(6): 683-691. Alizadeh, H.M and Handifield, R. (2018). IEEE Transactions on Engineering Management, 99:1-14. Amin, S. B and Alam, T. (2018). The Relationship Between Energy Consumption and Sectoral Output in Bangladesh: An Empirical Analysis, The Journal of Developing Areas, 52(3): 39-54. Asid, R. Kogid, M. Mulok, D and Lily, J. (2012). Intellectual Property Rights Protection, Foreign Direct Investment and Economic Growth in Malaysia: An ARDL Bound Test Approach. Asian Journal of Empirical Research ,2(2): 9-19. Bailey Norwood, F and Lusk, J. (2018). Agricultural Marketing and Price Analysis. Technology & Engineering, Page, 445. Brorson, B.W., Chavas, J.P., Grant, W.R., Schanke, L.D. (1985). Marketingmargins and price uncertainty: The Case of the U.S. Wheat Market. Amer. J.Agr. Econ., 67: 521-28. Campenhout, B. V, Pauw, K and Minot, N. (2018). The impact of food price shocks in Uganda: first-order effects versus general-equilibrium consequences, European Review of Agricultural Economics, https://doi.org/10.1093/erae/jby013. Charley, X and Rohan, N. (2018). Exploring Australia's comparative advantage for exporting fresh produce, Agricultural Commodities, 8(1): 176-198. Crop Statistic Book (2016). Agricultural Statistics of Agricultural Crop Years of 2013-2014, Tehran, Ministry of Agriculture, Deputy of Planning and Economic. Da Silveira R. L., Mattos F. (2015). Price And Volatility Transmission In Livestock And Grain Markets: ExaminingThe Effect Of Increasing Ethanol Production Across Countries, Applied Economics Association and WesternAgricultural Economics Annual Meeting, San Francisco. Fathi, D., Sohrabi, B. and Kochekzadeh, M. (2011). Investigation of the effects of different irrigation water and nitrogen regimes on cotton yield and yield component under furrow and sprinkler irrigation methods. Electrical journal of crop production, 4 (1): 61-74. Frigon, M., Maurice, D., and Romain, R. (1999). Asymmetry in farm-retail pricetransmission in the northeastern fluid milk market. Food Marketing PolicyCenter. Research Report No. 45. Galariotis, E; Makrichoriti, P and Spyrou, S. (2018). The impact of conventional and unconventional monetary policy on expectations and sentiment. Journal of Banking & Finance, 86:1-20. Gamtessa, S and Olani, A. B. (2018). Energy price, energy efficiency, and capital productivity: Empirical investigations and policy implications, Energy Economics, 72: 650-666. Grossmanna, A., Love, L., and Orlov, A. G. (2014). The dynamics of exchange rate volatility: A panel VAR approach. Journal of International Financial Markets, Institutions & Money, 33: 1–27. Haeri, A. and Asayesh, A. (2009). Cotton situation in Iran and the world. Office of study of statistic and in textile industry. p.2-17. Hannan, E.J. and Quinn, B.G. (1979). The determination of the order of an autoregression. Journal of the Royal Statistical Society. Series B (Methodological): 190-195. Hayakawa, K. (2016). Improved GMM Estimation of Panel VAR Models, Computational Statis-tics and Data Analysis, 100: 240-264. Hayakawa, K. (2017). Corrected Goodness-of-Fit Test in Covariance Structure Analysis. Doi: http://dx.doi.org/10.2139/ssrn.2965271. Hussein, H. (2018). Tomatoes, tribes, bananas, and businessmen: An analysis of the shadow state and of the politics of water in Jordan.Environmental Science & Policy, 84:170-176. Joets, M; Mignon, V and Razafindrabe, T. (2017). Does the volatility of commodity prices reflect macroeconomic uncertainty?. Energy Economics, 68: 313-326. Jouida, S. (2018). Diversification, capital structure and profitability: A panel VAR approach. Research in International Business and Finance, 45: 243-256. Juodis, A. (2017). First difference transformation in panel VAR models: Robustness, estimation, and inference. Econometric Reviews.37(8): 893-929. Kargbo, J. M. (2005). Impacts of monetary and macroeconomic factors on food prices in West Africa. Agrekon, 44: 205-224. Lin, B., and Zhu, J. (2017). 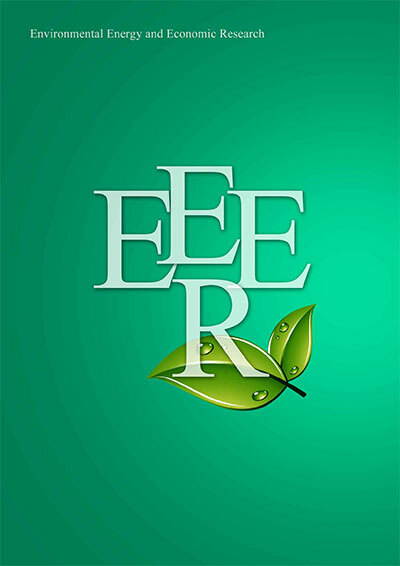 Energy and carbon intensity in China during the urbanization and industrialization process: A panel VAR approach, Journal of Cleaner Production, 168: 780-790. Mekbib, G., Matthias, K and Joachim V. (2016). Worldwide acreage and yield response to interational price change and volatility: Adynamic panel data analysis for wheat, rice, corn and soybeans, Food Price Volatility and Its Implications for Food Security and Policy(139-165). Molele, S. B and Ncanywa, T. (2018). Resolving the energy-growth nexus in South Africa, Journal of Economic and Financial Sciences, 11(1), DOI: https://doi.org/10.4102/jef.v11i1.162. Nasir, M. A and Du, M. (2018). Integration of Financial Markets in Post Global Financial Crises and Implications for British Financial Sector: Analysis Based on A Panel VAR Model, Journal of Quantitative Economics, 16(2): 363–388. Ojewumi, S.J., and Akinlo, A.E. (2017). Foreign direct investment, economic growth and environmental quality in sub-saharan Africa: a dynamic model analysis, African Journal of Economic Review, 5(1). Parsley, D.C (2012). Exchange Rate Pass-Through in South Africa: Panel Evidence from Individual Goods and Services. Journal of Development Studies, 48(7): 832-846. Salimi Far, M and Dehnavi, J. (2009). Comparing the Environmental Kuznets Curve in OECD countries and developing countries: analysis based on panel data. Journal of Knowledge and Development, 29: 181-200. (In Persian). Seth, N and Sidhu, A. (2018). Price Discovery and Volatility Spillovers in Indian Wheat Market: An Empirical Analysis, Journal of Applied Finance; Hyderabad, 24(2): 5-20. Shahateet, M. I. (2014). Modeling Economic Growth and Energy Consumption in Arab Countries: Cointegration and Causality Analysis. International Journal of Energy Economics and Policy, 4(3): 349-359. Tarfirenyika, S. (2017). Energy Consumption and Economic Growth Modelling in SADC Countries: An Application of the VAR Granger Causality, International Journal of Energy Technology and Policy, MPRA_paper_86505.pdf. Thach, N. N, Oanh, T. T. K. (2018). Effect of Macroeconomic Factors on Capital Structure of the Firms in Vietnam: Panel Vector Auto-regression Approach (PVAR). International Conference of the Thailand Econometrics Society, 753: 502-516. Url, Th; Sinabell, F and Heinschink, K. 2018. Addressing basis risk in agricultural margin insurances: The case of wheat production in Austria. Agricultural Finance Review, 78(2): 233-245, https://doi.org/10.1108/AFR-06-2017-0055. Wang, D; Yue, C; Wei, S and Lv, J. (2017). Performance Analysis of Four Decomposition-Ensemble Models for One-Day-Ahead Agricultural Commodity Futures Price Forecasting, Algorithms, 10(3). Wharton, Jr. (2017). Subsistence Agriculture and Economic Development, New York: Routledge. Zare Mehrjerdi, M. and Tohidi, A. (2014). An Empirical Analysis of Exchange Rate Pass-Through to Iran's Saffron Export Price. Ethno-Pharmaceutical Products, 1(1): 29-36. Sims C. A. (1980). Macroeconomics and reality. Econometrica, 48(1): 1-48. Holtz-Eakin D., Newey, W., and Rosen, H.S. (1988). Estimating vector autoregressions with panel data. Econometrica, 56(6):1371-1395.